VO-660 61 (Serial #64254) is ex-AT&N 601 and seen here at Springfield, Missouri on February 25, 1961. The unit would later be Foreman Cement #61 and then belong to Arkla Chemical Corporation (Stanley McCarthy). 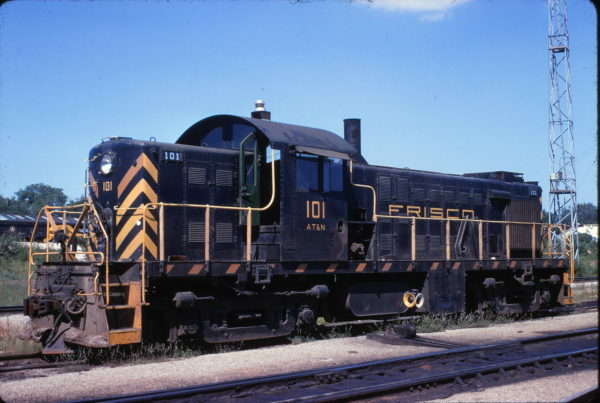 AT&N RS-1 102 Lindenwood Yard in August 1965. This photo was taken from the Arsenal street bridge looking east of the Lindenwood Yard. Note the unusual 2 domed tank car. Nick Molo posted a photo from the same spot on June 26, 2015. Special thanks to Rich Lawler. RS-1 101 at Springfield, Missouri on July 30, 1968. 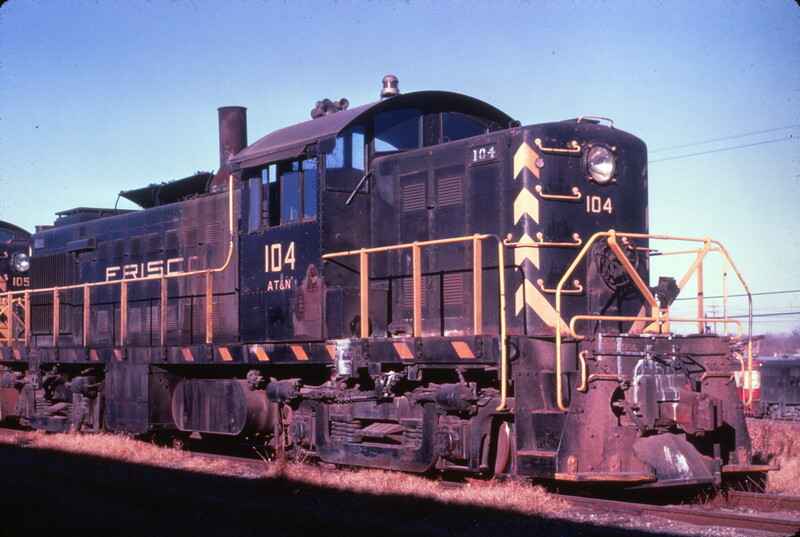 RS-1 103 at Blytheville, Arkansas on March 29, 1969 (Carl Munch). RS-1 107 at Springfield, Missouri on October 31, 1965 (Arthur B. Johnson). The locomotives are on the diesel pocket track. This track is used for longer term storage of shop bound locomotives. Units located here typically require an above average length of work time in the shop. They are rotated into the shop as space, materials and personnel could be scheduled. 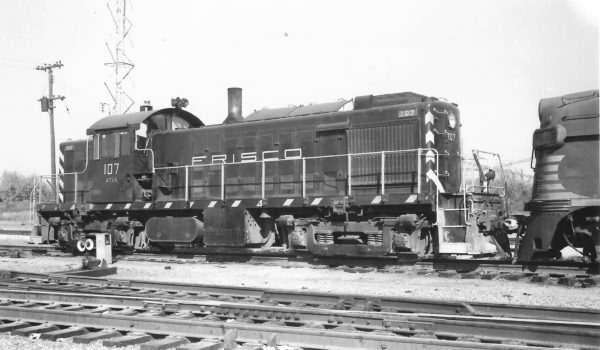 Note the locomotives are tied down based on the wedge shaped wood chock blocks under the locomotive’s wheels. In addition to the hand brake, these help prevent the locomotives from rolling down the grade to the west. The diesel pocket is east of the Springfield Diesel Shop and Kansas Avenue. It is northeast of the Mechanical Department’s service tracks area. The “new” turntable would be installed just to the north of this location. The turntable was relocated and installed in the late 1970s after the new diesel shop and service tracks area was built at Cherokee Yard in Tulsa, Oklahoma. The track in the foreground forms the east end of the diesel shop lead. The diverging turnouts lead to the east end of the service tracks area. The track beyond the locomotives is the Clinton Subdivision. This route leads to the West Shops area, ribbon rail plant, Benwood Yard, tie treating plant and out of town to Clinton and ultimately Kansas City. The yard floodlight tower stands between the diesel pocket track and the Clinton Sub track. Visible on the rise in the distance, between the locomotive noses, are parts of the conveying systems at Ozark Hardwood Company. On this spur track the Frisco served this industry as well as Springfield Plywoods, Inc. Further east toward Broadway Avenue, off a separate spur is Barclay-Love Oil Company. 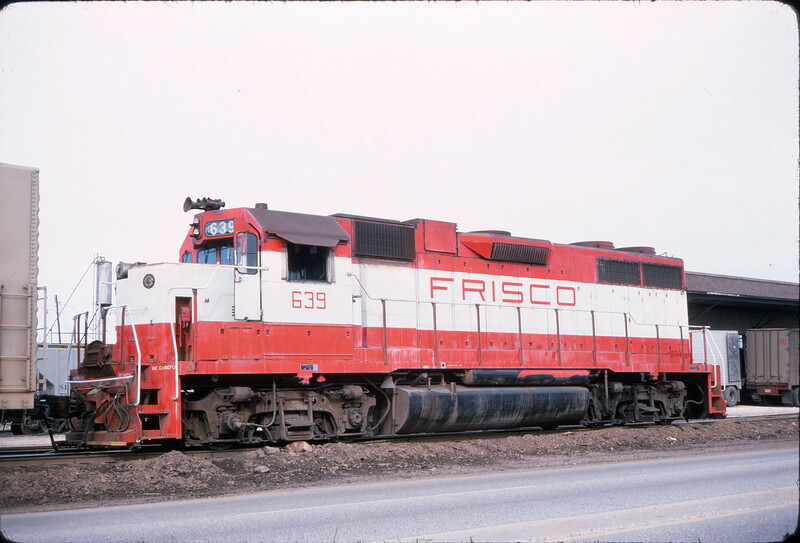 GP38AC 639 at Mobile, Alabama in May 1975. 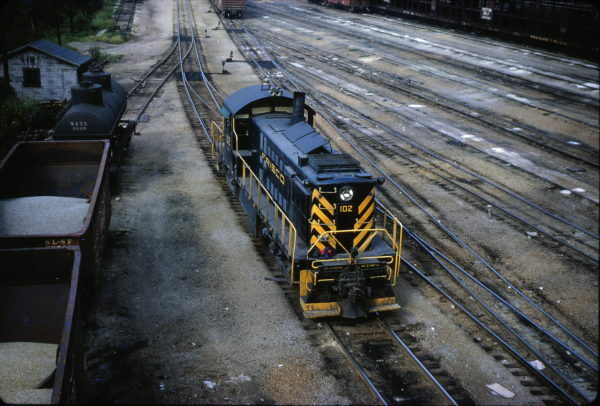 The locomotive is sitting on the south yard lead and drill track at Mobile Yard (MP 873.5). The body of the yard is to the north (left) of this location. The engineer is facing to the right the diverging yard ladder switch stands. Although the yard is double ended, the north end has a very short lead. It serves mainly as an escape track for inbound power or attaching an outbound caboose, but due to its short length it was not very useful for drilling the yard tracks from the north. This is the former Alabama, Tennessee and Northern (AT&N) facility north of the downtown central business district. For the last five miles, access in and out of the railroad’s facilities was by trackage rights over the Terminal Railway Alabama State Docks (TASD). From Terminal Junction (MP 868.5) the route crossed the Southern Railway (MP 686.6) and the TASD’s Three Mile Creek drawbridge (MP 870.6). Back on home rails the final approach to the yard included a sharp “U” shaped curve, turning inbound train’s direction from south to north northwest. The yard is bounded on the north by Three Mile Creek, a navigable industrial canal off Three Mile Creek to the east and to the south and west by Telegraph Road. This photograph was taken from the latter. Left of the locomotive’s nose is the sand tower at the Mechanical Department’s locomotive service tracks. The facilities were very modest at this location, limited to fuel, sand and basic supplies. Adjacent was a small freight car RIP (repair in place) track facility. They were near the mid-southeast corner of the property. Access by rail was from the north off the south yard ladder. They were just northeast of the freight house. In the background on the right is the northwest corner of the freight house. The building’s offices are on the south end. Like the body of the yard, the freight house axis runs north northwest to south southeast. The facility’s address is 701 Telegraph Road, Mobile, AL 36610. This building still stands and is the local office for the Alabama & Gulf Coast Railway (AGR). RS-1 104 at Springfield, Missouri (date unknown) (R. Wallin). The subject locomotive is in storage on the north of two tracks at the Springfield Stockyards. The stockyards are west of North Broadway Avenue, at the east end of Springfield Yard. The yard is also known as West Yard or Kansas Avenue Yard. The stockyard tracks sat on a rise south of the Frisco’s main tracks, yard leads and locomotive service tracks area. Coupled to the front of the locomotive is another RS-1, 105. 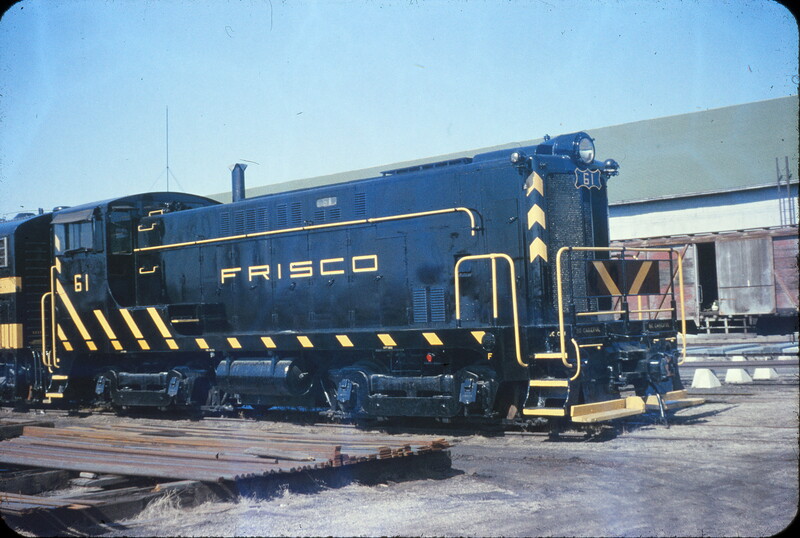 The Frisco Archive also includes an afternoon photograph of that locomotive taken in 1969. The date helps establish timeframe context to explain several factors in this image. 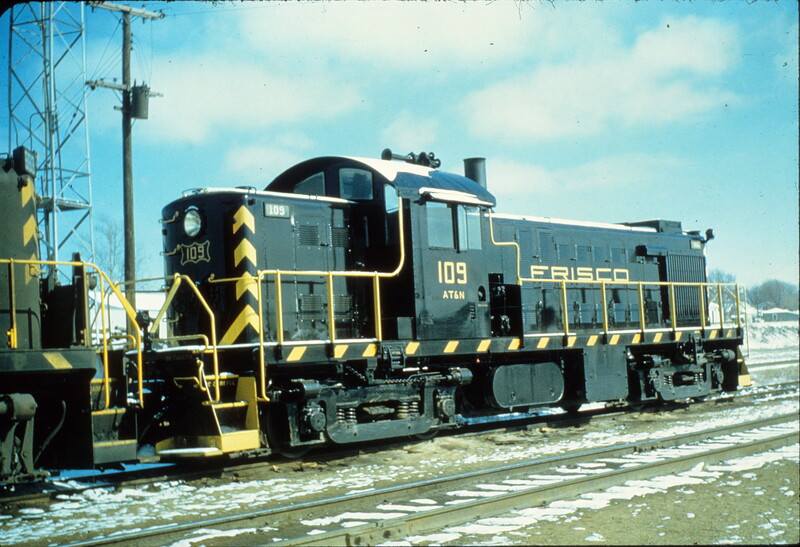 Records indicate both locomotives, along with sister RS-1s 103 and 108, were retired in November 1969. That is why the units are in storage outside the Mechanical Department’s area. 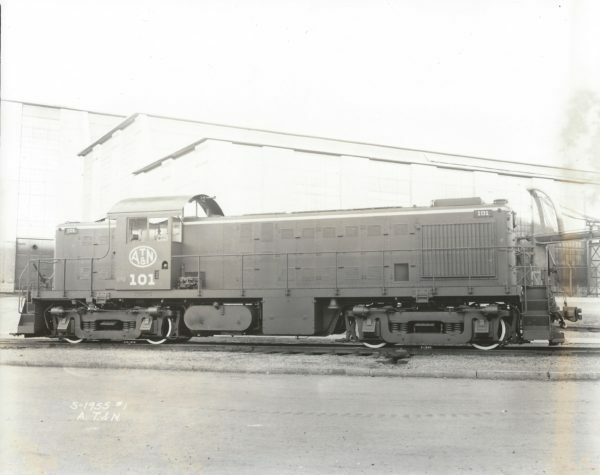 The units are in just before being shipped to Electro-Motive Division as trade-in for new locomotives. In the distance to the right of the road switcher’s pilot is the lattice boom of a crane. This is the timeframe when construction was started on the improvements at the service tracks area and the city began constructing the new North Kansas Avenue viaduct. Also visible are locomotives at the service tracks area. The service tracks are just east of the Springfield Diesel Shop. The view is looking northwest. RS-1 101 in November 1944 (ALCO Builder’s Photo). RS-1 110 in August 1946 (ALCO Builder’s Photo). 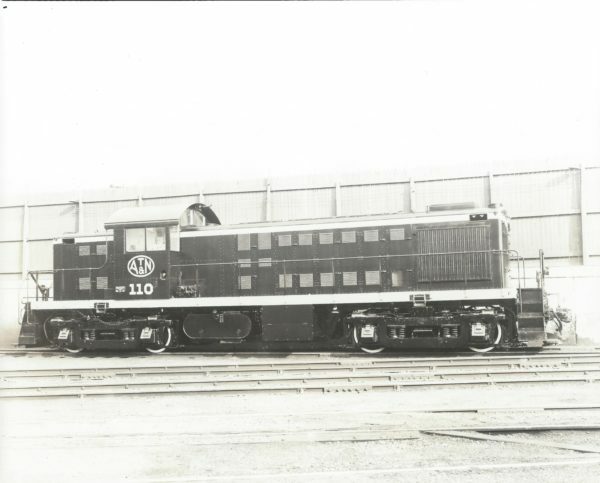 RS-1 109 at Springfield, Missouri (date unknown). The location is the diesel pocket track east of the Springfield Diesel Shop. This is near the bulk sand storage tank and unloading shed. The track to the north, behind the engines, is the High Line. Today, the “new” turntable sits further to the northeast.